The weekend of September 8-9 will long be remembered by the parishioners of Holy Resurrection Serbian Orthodox Church in Steubenville, Ohio as a dual celebration: the marking of their Petar Krstich Choir's 75thAnniversary and the first canonical visit of His Grace Bishop IRINEJ to the parish. A highlight of the weekend and a special joy for the choir was the presence and honoring of the founder of the choir, Protinica Miryana Trbuhovich, by His Grace, the parish, the choir, and the entire Serbian Orthodox Church. On Saturday, September 8, His Grace and Protodeacon Milos Zdralic arrived in Steubenville and were welcomed by parish priest Prota Rade Merick, who escorted them to the concert held at the First Westminster Presbyterian Church, near Holy Resurrection. His Grace was welcomed with the singing of Ton Despotin by the combined choirs: St. Elijah Choir of Aliquippa, Tsar Lazar Men's Choir, and host Petar Krstich Choir. With His Grace's blessing the Lord's Prayer, the U.S. and Serbian national anthems and Memory Eternal for all departed choir members were sung, followed by selections from each choir. St. Elijah Choir, the kumovi or sponsoring choir for the Petar Krstich Choir when it joined the Serbian Singing Federation and honored guest choir for this anniversary celebration, was directed by Kathy Loverich and Cissy Rebich, while the Tsar Lazar Men's Choir was directed by George Milosh and host Petar Krstich Choir by Nino Karas. A welcome was extended by PK Choir president Maria Karas, and special recognition was given to Protinica Miryana Trbuhovich, the PK Choir's founding director, with a standing ovation by all present and the singing of Many Years. A celebratory dinner and dance followed the concert at the Williams Country Club in neighboring Weirton, WV. Guided by master of ceremonies Milan Vuchenich, the highlight of the program was the address by His Grace Bishop IRINEJ. His Grace congratulated and praised the PK Choir for its many years of service to the local parish and to the entire Serbian Orthodox people of North America. He recalled in particular the great contributions of longtime director +Slobodan Zelich, who in addition to his directing duties contributed 100 arrangements and compositions to the repertoire of Serbian choral music. His Grace then presented an Episcopal Grammaton to the PK Choir in recognition of it dedication and contributions over the past 75 years. 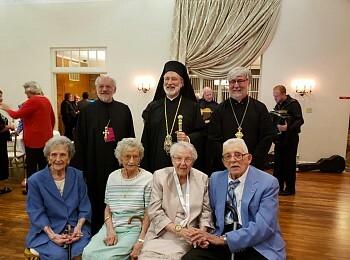 Three of the original members of the old Miryana Singing Society in addition to Protinica Miryana were present at the banquet to witness this recognition: Louise Vuckovich, Mildred Vuckovich and George Rocknage. His Grace then delighted and gratified all present with special recognitions for Protinica Miryana Trbuhovich. Protinica Miryana, wife of Protopresbyter-Stavrophor Mladen Trbuhovich of blessed memory, came to Steubenville at the end of 1942 as a new bride and new popadija. Born in Chicago in 1918 as Miryana Simich, she had extensive musical training, and she took it upon herself to organize a choir in her husband's first parish. In 1943 she formed the “Mirjana Choir,” which bore her name, and which later became the Petar Krstich Choir to conform to the rules of the Serbian Singing Federation when it joined the SSF. Prota Mladen and Protinica Miryana went on to serve eight Serbian Orthodox parishes over nearly 40 years of service, and had three children: Yovanka, who directed the church choir in San Diego; Gordana, who has directed Serbian, OCA and Pan-Orthodox choirs in the Chicago area for the past 40 years and who accompanied her mother to this celebration, and Protopresbyter-Stavorphor Rastko Trbuhovich of blessed memory, who continued his family tradition of giving illustrious clergy to the Church's service and who was active in arranging liturgical music, especially in English. His Grace then made two surprise presentations to Protinica Miryana. The first was an Episcopal Grammaton recognizing her “for her many years of outstanding and dedicated service, laboring in the Vineyard of the Lord….” “praying that the Lord our God grant her in this, the jubilee One Hundredth Year of her life many more blessed years of health, joy and blessings.” His Grace then followed with an even more prestigious award for Protinica Miryana. On his recommendation, the Holy Synod of the Serbian Orthodox Church bestowed upon Protinica Miryana, in the words of the accompanying citation, “the high decoration of the Serbian Orthodox Church, the Order of the Holy Despot Stefan Lazarevic, for her steadfast and ongoing love for the Holy Mother Church, exhibited especially in her whole-hearted and decades-long devotion to church music, chant, culture and tradition.” Having read this citation, signed by His Holiness Serbian Patriarch IRINEJ, His Grace placed the medal of the Order of St. Stefan Lazarevic around the neck of Protinica Miryana, exclaiming “Axia, Dostojna, She is worthy!” to which all present responded with the same in song. 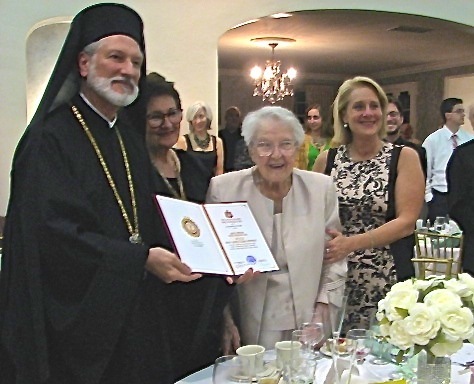 Many tears of joy and gratitude were shed as Protinica Miryana received this well-deserved recognition by her Church. The celebration lasted into the evening as guests offered congratulations to Protinica Miryana and the other charter members of the PK Choir present, danced, visited and perused the memorabilia table documenting the Choir's 75 years of service. The next morning the choir and faithful again gathered at Holy Resurrection Church in Steubenville for the Hierarchical Divine Liturgy and the first canonical visit to the parish by His Grace Bishop IRINEJ. Assisting His Grace at the Liturgy were visiting clergy Protopresbyter-Stavrophor Dr. Rodney Torbic, Father Duane Johnson, Protodeacon Milos Zdralic, and host pastor Fr. Rade Merick, with responses beautifully led by the Petar Krstich Choir, Nino Karas directing. On this day which commemorates All Serbian Saints, His Grace gave an inspiring homily. Following the Liturgy the choir hosted everyone in the church Lyceum for a luncheon, at which parishioners had an opportunity to get to know their Bishop. His Grace concluded his visit with a short meeting with the congregation's executive board, at which he answered questions and gave his observations and suggestions concerning the parish, and also informed the board of progress being made on the rebuilding of St. Sava Cathedral in New York City following the disastrous fire of two years ago. This weekend will long be remembered by the parishioners of Holy Resurrection and its Petar Krstich Choir as a worthy celebration of the Choir's 75thanniversary, the return and honoring of their former Protinica and choir founder Miryana Trbuhovich as she prepares to celebrate her 100thbirthday, and the joy of welcoming their Bishop and Archpastor IRINEJ to their midst to receive his blessing and his wise guidance.